Videos have become one of the most effective types of content to share your expertise and knowledge with others. Oftentimes you want your users to view but not download your private videos. So how to prevent users from downloading your private videos? Don’t worry, you can easily achieve that with our Protect WordPress Videos extension with just a few single clicks. Once you’ve installed our extension, please follow these 3 simple steps below to start protecting your WordPress videos now. Step 1: Go your where you want to insert your video then click on our plugin’s icon on your post editor. Step 2: A popup will appear allowing you to choose a video that you want to protect. A plugin’s shortcode will be automatically generated for you, which embed your video into your content and protect them against downloading. Step 2: Click “Add Media” then choose your desired video. Please make sure that the video is protected. If it’s not, you can protect it directly on the right sidebar. 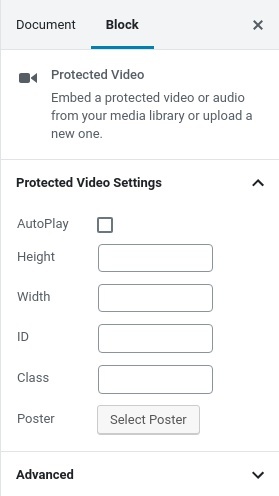 Step 3 (optional): Under our Protected video block settings, you can set the video’s height, width, add a custom poster as well as make the video autoplay if you’d like to. Here you go. With our Protect WordPress Videos extension, you now can allow your users to view your videos online but not download them. Please make sure that your video is protected by our Prevent Direct Access Gold before embedding it into WordPress content. You can do so directly on Media page or during step 2 below when clicking on “Add Media”. Otherwise, the video will be still downloadable.